These fantastic vegan and gluten-free chickpea crackers are sprinkled with dukkah and perfect for afternoon snacking. My husband is a bit of snacker. He likes to nibble on crackers and cheese or dips or other snacky things between meals. I, on the other hand, eat when it’s meal time, and if I eat in between it’s usually a piece of cake or cookies or a square of chocolate, and more often than not those “snacks” actually occur at the tail end of a meal, rather than in between. So, as I don’t think about snacking, I’ve been rather neglectful of my husband’s love of snacks to nibble on in between meals. But watching an episode of Parts Uknown on Spain, and salivating over the tapas, I decided I should delve headlong into this world and see what it is all about, and make my husband happy in the process. Over the weekend our meals became tartines, crudites, crackers, dip, cheese, rye bread with homemade butter and chopped up pieces of fruit. It’s the best type of meal because you get to pick and choose each bite. Sometimes it is a crunchy sweet carrot stick, other times it is the combination of crumbly cracker and smooth dip. Or a piece of garlicky toast with olive oil, tomato, sea salt and torn basil. 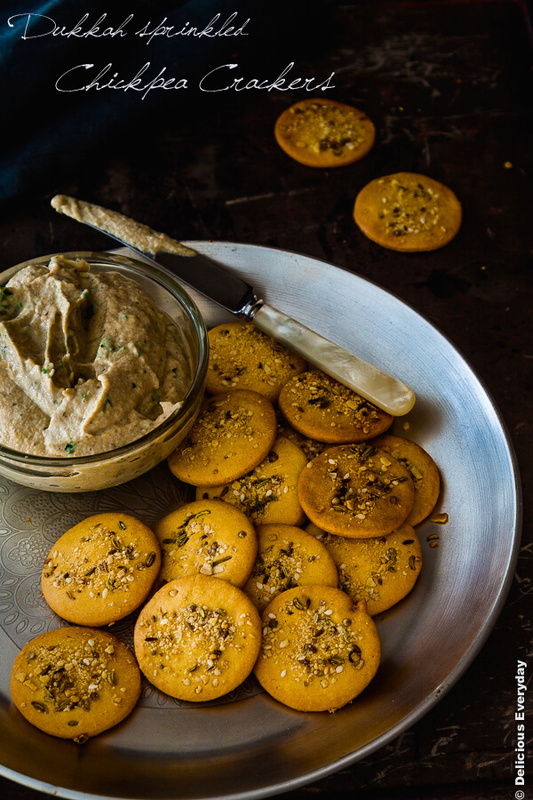 These Dukkah topped Chickpea Crackers have been several times over the last few days, and appeared in each of our snacky meals, along with a moonlit and mosquito filled picnic that I surprised my husband with late last week. Each time they have made an appearance they have disappeared quickly. 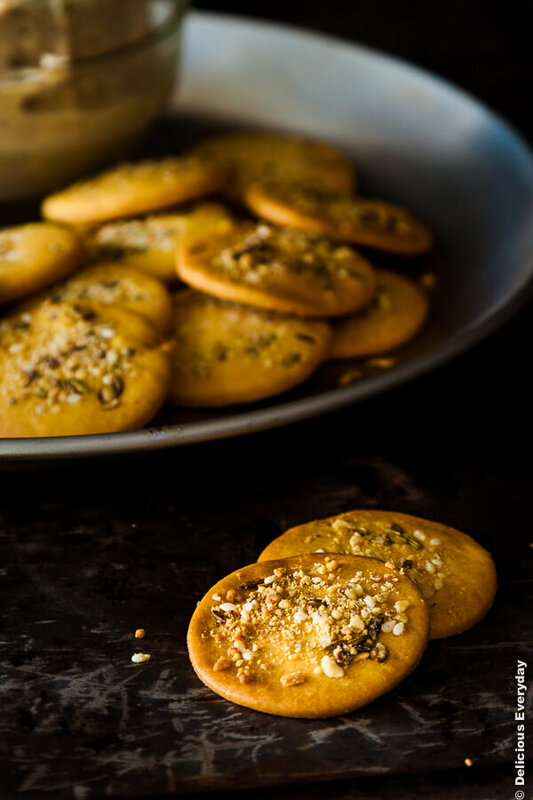 They meet the snacky needs of my husband, but more than that they are super easy to throw together, and the sprinkle of dukkah on top transforms them into a snack all of their own, even without a dip to accompany them. You can skip the dukkah topping of course, but I really do think it adds a whole other dimension to the crackers. Don’t have dukkah? Try a sprinkling of black and white sesame seeds, toasted cumin seeds or nigella seeds. So tell me, are you the type of person that snacks in between meals or are you more of an eat at meal times person like me? Preheat the oven to 180 celsius (350 Fahrenheit) and line a large baking tray with baking paper. Place flour, salt, baking powder and the oil in a food processor and process until the mixture resembles wet sand. Add the water 3 tbs at first and the 4th if necessary, and process until the mixture forms a ball. Remove the dough from the food processor and place on a piece of baking paper and gently knead until smooth. Flatten the dough and place another piece of baking paper on top and roll out the dough using a rolling pin to a thickness of 5mm (1/5 of an inch). Use a cookie 5cm (2 inch) diameter cookie cutter to cut out the cookies and place on a baking tray lined with baking paper. Sprinkle each cracker with dukkah and use your fingers to spread it out over the cracker. Run the rolling pin gently over the top of the crackers so that the dukkah gets slightly embedded in the dough. Bake for 12 to 15 minutes, or until golden around the edges. Place on a cooling rack to cool completely before placing in an air tight container, if not serving immediately. You need to fix the amazon links on the ingredient list of your recipe. Thanks for letting me know Rebecca. It’s fixed now. 🙂 Enjoy the crackers! Im a total snacker too and these look like the perfect 3pm snack! Snack foods has to be quick and easy to make and this certainly ticks these boxes! I agree Martine 🙂 Quick and convenient always wins out with me. Ahh! Dukkah is my favourite. This looks amazing! Thanks Rebecca 🙂 I’m a huge dukkah fan too. I love the simplicity of this recipe. I always have Dukkah stashed in the freezer as it has so many uses. I love savoury snacks so I have just added another use for the Dukkah. Thanks. Awesome! I have been looking at creative ways to use chickpea flour and this looks like a great snack to have. The dukkah sounds incredible overtop. Thanks for sharing! Really tasty-looking! Healthy, tasty, easy…what more can I ask for? Thanks for sharing! I am such a snacker as well, these crackers are perfect for my afternoon cravings! These look delicious! 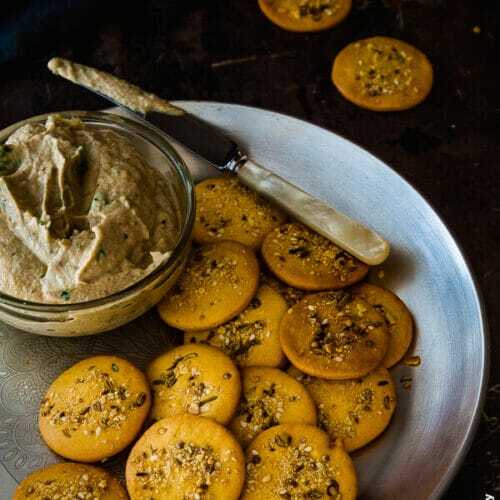 I love chickpea flour but have never thought of making cracker – such a good idea. More power to the snackers! Here in WA it was a public holiday, and it is illegal not to snack on public holidays*. To meet my snacking obligations, I made these today and they were delicious! I used our locally-made Riki Kaspi brand dukkah. Probably due to the humidity, I only had to use just 3 tablespoons of water to make the dough. Love how crispy and savoury they are, and how quick they are to make, as this means there is less time spent baking and more time snacking. These are definitely on the menu for snack-inclined gluten-intolerant friends. *This may or may not be strictly true. 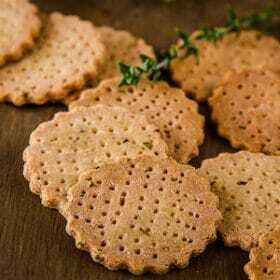 I love simple recipes like this, with a big pay off at the end 🙂 If you liked these crackers you might also like these herb and garlic amaranth crackers on which I based this recipe. 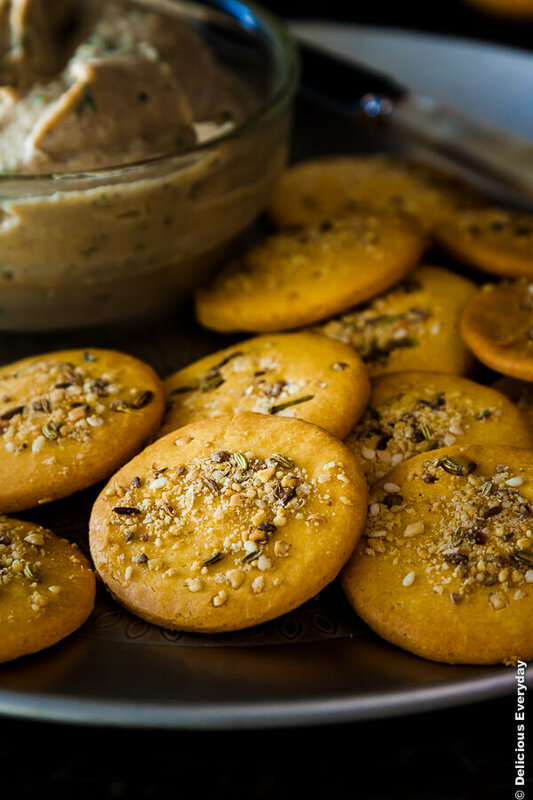 Absolutely brilliant recipe…I love Indian recipes of besan crackers we make at home…and this one is a treasure to keep. These look so delicious!! Do you also make your own blend of dukkah?